The main plan for today had been to visit the Top of the Rock observation platform at the Rockefeller Center and to do some shopping. We started off with the shopping, walking up Lexington Avenue to Bloomingdales, where we stopped for a New York cheese cake at Magnolia Bakery. From there we cut across to 5th Avenue, to the underground Apple shop, which we’d actually walked past on Monday without realising. The glass cube entrance was impressive, but would have been even better if it wasn’t full of scaffolding. I like how in a town of high rise buildings Apple built what is essentially a small green house. Next to the Apple shop is FAO Schwarz, the famous toy shop, so we had a look in there for Christmas presents for our friends’ children, before braving Tiffany’s. I’d never seen so much jewellery in one place, the store was enormous and there must have been millions of dollars of diamonds there. Jen dropped some hints, luckily she thought a lot of it was too bling and not her style and I escaped with my wallet intact. 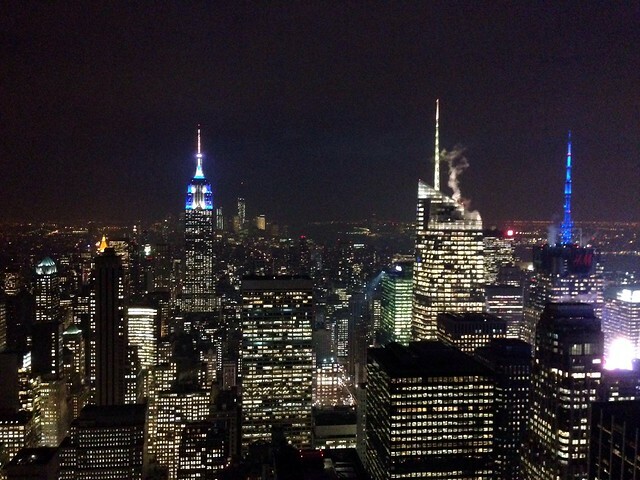 After advice from a few people who’d been to New York before, we decided to bring forward our trip to Top of the Rock, so that we would be up there for sunset, seeing the city both by day and night. As we were walking down 5th Avenue towards the Rockefeller Center, we noticed that the NYPD were out in force and that there appeared to be something happening at the Rockefeller Center. We got our tickets exchanged and thought no more of it. After another morning with a lot of walking it was time for lunch. We’d spotted a few branches of Chipotle, a Mexican fast food chain, which seemed a lot like Barburrito, one of our favourite places at home, so we decided to go there for lunch. It did turn out to be like Barburrito, only with bigger portions – great! Just in case we got hungry later on we also stopped at Dunkin Donuts on the way back to the hotel – when in Rome and all that. Later in the afternoon, as we walked back up to the Rockefeller Center it became apparent why the NYPD were out in force – the lights on the Rockefeller Center tree were being switched on. In the States this is a big deal and is televised nationwide. Large crowds had already begun to gather to see performances by Kelly Clarkson and Mariah Carey, amongst others – it was chaos! We eventually got to the bottom of the lift for the Top of the Rock, after passing through more airport style security and having our picture taken we were stood in the lift about to go up 67 floors. As the lift started the lights went out to allow us to see the illuminated shaft we were travelling up through the clear ceiling. We got up to the outdoor viewing area on the 67th floor just before dusk, although the sky was quite hazy, so we could only just make out the Statue of Liberty in the distance. We were also able to see just how far we’d walked on day two, Central Park is enormous! It was fun using the augmented reality Top of the Rock app I’d downloaded to my iPhone to identify the various skyscrapers. It was strange looking down on the smaller buildings, then realising that they were still over ten stories high – higher than the tallest buildings in Coventry! Before it got dark we took the escalator, then stairs to the 69th floor, which was better for photos due to the lack of protective glass. As the sun dropped the lights on various buildings began to switch on and soon it was time to take some nighttime images. At night the view down town is better than the view to the north, over Central Park. The Empire State Building was lit up blue and white in honour of Chanukah and dominated the skyline. When we got out of the Rockefeller Center we had to take a detour back to the hotel, due to road closures for the tree lighting ceremony. We tried a few places for dinner, but ended up at the hotel restaurant, Madison and Vine. The restaurant seemed really popular and we soon found out why, the food was great. I had meatloaf with mushrooms and mash and Jen had steak and chips. After dinner we tried to go to the hotel bar, but it was closed for a private function again so hopefully it’ll be third time lucky tomorrow!